King Tri Ralpachen (Tib. ཁྲི་རལ་པ་ཅན་, Wyl. khri ral pa can) also known as Tritsuk Detsen (Tib. ཁྲི་གཙུག་ལྡེ་བཙན་, Wyl. khri gtsug lde btsan (9th century, 806–838) — one of the three ancestral religious kings and one of King Trisong Detsen's grandsons. He ruled Tibet from 815 until 838, when he was assassinated. Trisong Detsen had three sons—the oldest was Mune Tsepo, the middle one Murup Tsepo, and the youngest Mutik Tsepo. All three spread the Buddhist teachings in Tibet. 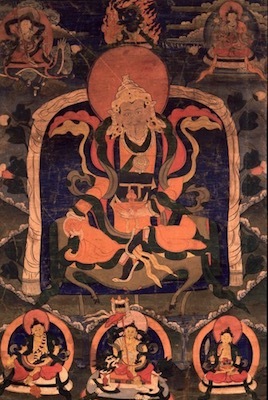 Tri Ralpachen was one of the five sons of Mutik Tsepo and was said to be an emanation of Vajrapani. He was extremely devoted to the teachings of the Buddha and is famous for having built one thousand temples. Accordingly they revised the translations, such as those of the Prajñaparamita. Yet since the meaning of the inner tantras cannot be grasped by ordinary persons they did not revise them. ↑ It is said that he did not like to cut his hair and so he was called Ralpachen which means 'the one with locks of hair'. Based on the History of the Dharma by Dudjom Rinpoche (Wyl. bdud 'joms chos 'jung). This page was last edited on 5 May 2018, at 23:51.